There are many different reasons for adopting robotic palletisation – usually the very last process on a packing line. It may be that you want to increase the speed of your operation, or improve the quality of the finished product. Other drivers might include overhead reduction or manual handling considerations, while in some cases staff turn around and training makes the idea of having the consistency and flexibility of a robot very appealing. To determine the best solution we’ll discuss a number of factors including typical stacking patterns and the number of programmes that will be needed. Firstly, it’s important to take time to understand the whole process and identify the bottlenecks – you might find that the overall output of your line may not be restricted by the palletising operation. So once we have confirmed that automating the palletising operation is the right way to go, we work with clients to identify the top priority and use this to select the most appropriate solution. * What products/pack types do you want to handle? * At what speed will they be presented to the robot? * How many different pallet sizes do you want to use? * What stacking patterns are required? Having determined that a robotic solution is appropriate, the next step is to draw the layout and check that the proposed solution will work. For example, will the robot be able to reach everywhere it needs to at the speed required? It can often seem that there are a lot of questions before a potential product is proposed, but by getting sufficient detail early on we can avoid later changes to specification or project costs. The aim is to arrive at the right solution the first time. In most cases a single product line would feed a single palletising robot, but it is perfectly feasible to have two or three different lines coming into a single robotic cell, with two or three pallets going out. Switching between cases or sacks, tubs or drums is also perfectly achievable. Again, what is possible depends on the available space and the project budget. Whether you opt for a fully or partly automated solution will depend on a variety of factors, including budget and the amount of space available. In practice a level of automation to suit any circumstance can be provided, from a solution for low or seasonal use, through to automatic pallet dispensing and wrapping. The most basic solution is to have one pallet on the floor beside the robot, with the robot picking a single product from a single conveyor and stacking it onto said pallet. For many users this is all they need. However, the system needs to stop while the full pallet is exchanged for an empty one. The simplest upgrade is to have two pallets beside each other, with the robot stacking one while the full one is removed and replaced. 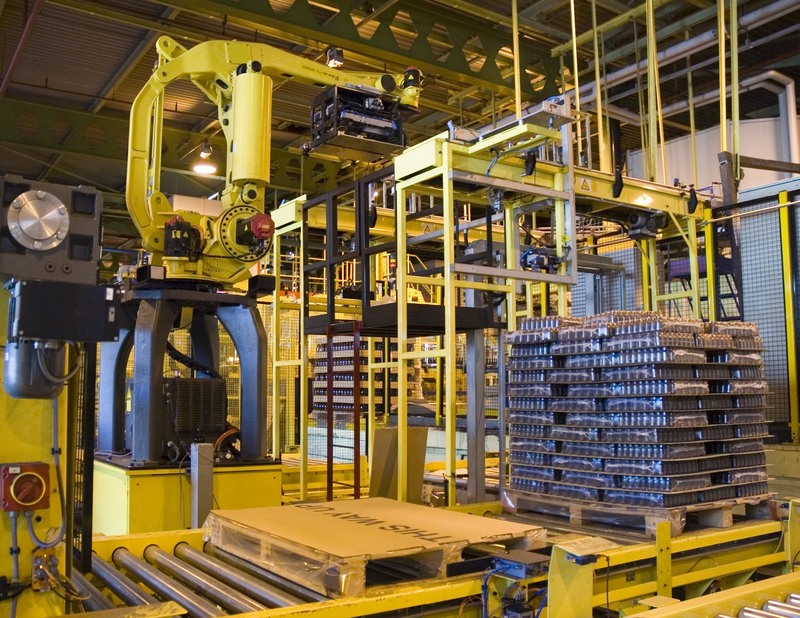 More complex systems could involve either the robot itself placing an empty pallet from a stack of say, ten or twelve, onto a set of rollers, which it then fills. The full pallet is then automatically ejected from the stacking cell and the robot starts the process again. Another option is to use a dedicated automatic pallet dispenser, a solution which is typically used on high speed lines when there isn’t time for the packing robot to put an empty pallet in position. Further upgrades would include feeding the full pallet to an automatic wrapper; either a turntable which spins the pallet or, for less stable pallets, a rotary arm. Stretch wrapping is the most popular wrapping solution, but nets and over the top covers can also be automated and top covers and slip sheets can be added where required. Normally we would try to ensure that a robotic solution is appropriately specified at the time of installation, including the ability to cope with routine changes in output such as daily fluctuations in order levels. Having said that, packing and palletising robots can be easily upgraded to accommodate changes to businesses, such as increased throughputs. Provided that a robotic arm can still work within its envelope of movement and can physically lift what you want to move, then that robot can be redeployed. This is achieved by changing the end effector and programming, so that it can pick up different items. If you haven’t already considered automating your end of line palletising, contact us for a free simulation of your process - it may be something that is more easily achievable than you first thought. 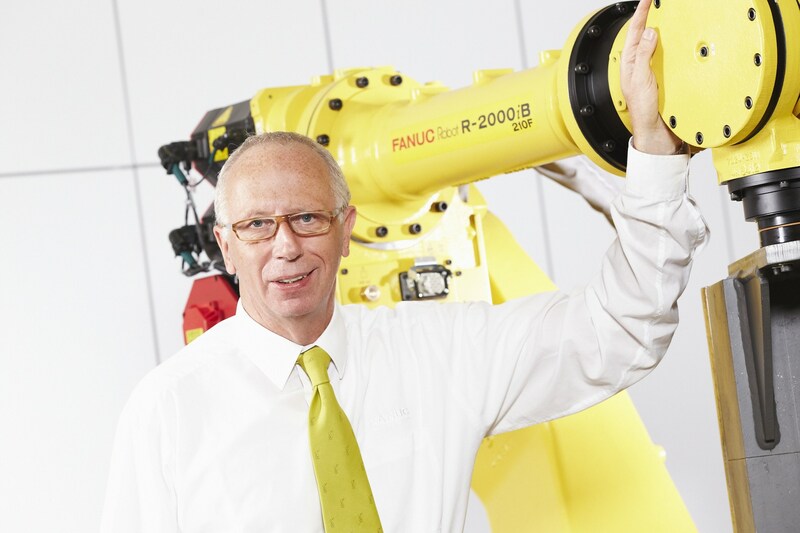 Chris Sumner is Managing Director at FANUC UK.